The Company posted record quarterly revenue of $46.33 billion and record quarterly net profit of $13.06 billion, or $13.87 per diluted share. These results compare to revenue of $26.74 billion and net quarterly profit of $6 billion, or $6.43 per diluted share, in the year-ago quarter. Gross margin was 44.7 percent compared to 38.5 percent in the year-ago quarter. International sales accounted for 58 percent of the quarter’s revenue. The Company sold 37.04 million iPhones in the quarter, representing 128 percent unit growth over the year-ago quarter. 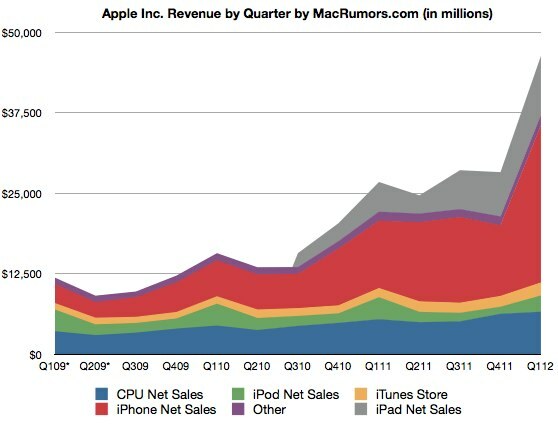 Apple sold 15.43 million iPads during the quarter, a 111 percent unit increase over the year-ago quarter. The Company sold 5.2 million Macs during the quarter, a 26 percent unit increase over the year-ago quarter. Pro trochu perspektivy: Microsoft má čistý zisk za stejnou dobu $7,99 mld. a Google $2,71 mld. Apple má tedy zisk asi o pětinu větší, než tyto dvě firmy dohromady. Pokud jde o iPhony, tak jich prodali za rok 2011 víc, než za roky 2007, 2008, 2009 a 2010 dohromady.